Status in Hawai’i: Alien. Low to moderate pest factor. 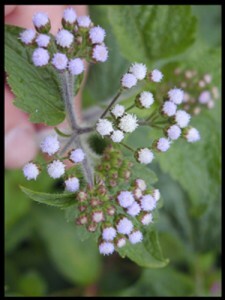 The name “Maile hohono” is somewhat of a misnomer, as this lovely little weed is more aromatic than stinky. Its main uses in Hawai’i are topical for fungal infections of the skin (“haole rot”). It is juiced and then the patient sunbathes to let the medicine work. Its’ use topically for skin conditions is confirmed by traditional medicines in China, Nepal, and Martinique. It is also juiced for topical use in ear infections. 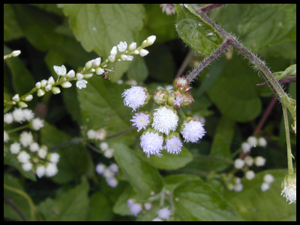 As pyrrolizidine alkaloids have been found in Ageratum, it is presumed to be dangerous if taken internally. Do not use in pregnancy or with liver disease.